After I posted instructions for making sourdough bread starter from scratch—just as Caroline Abbott might have done—several readers asked about the type of oven Caroline would have used. She and Grandmother used a brick bake oven. 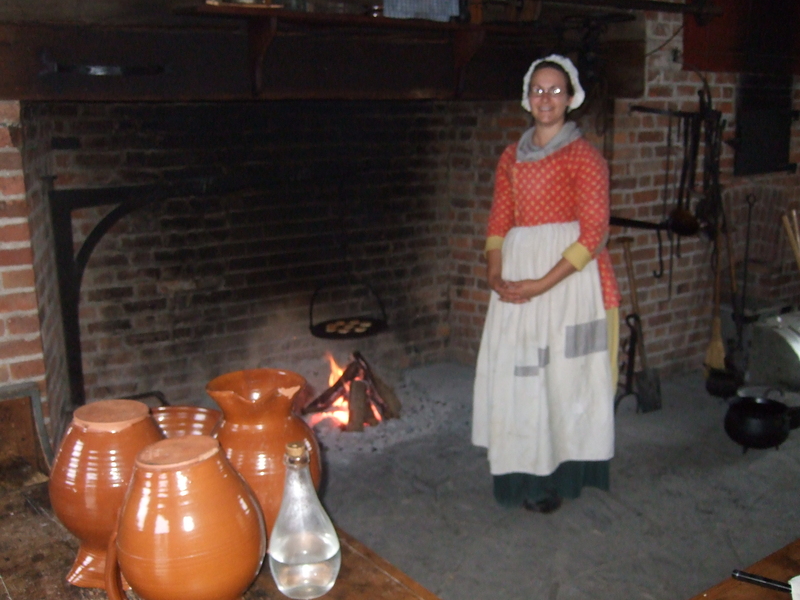 Women used these bake ovens for centuries. While visiting historic sites that interpret the period, I talked with several interpreters about foodways during Caroline’s era. 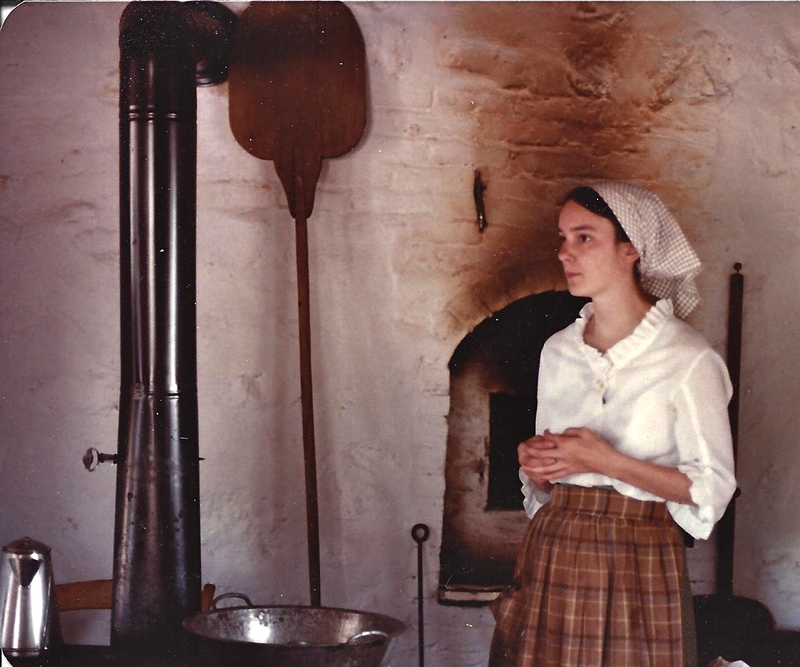 This interpreter was cooking in a kitchen at Old Fort Niagara. 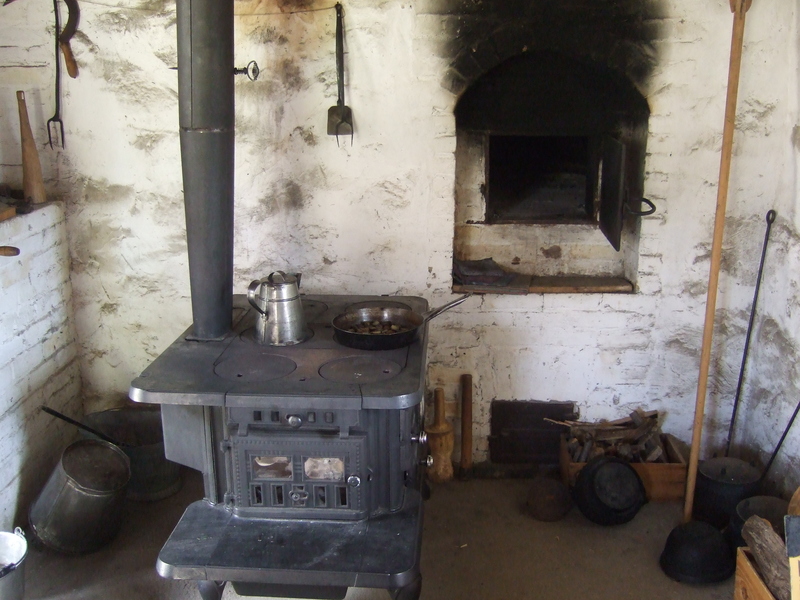 For anyone using a brick bake oven, building a fire inside the oven was the day’s first chore. It took hours to heat the bricks. Can you see the small oven door in the back of the fireplace? The arrangement at Old Fort Niagara (shown above) made the best use of the fire itself. 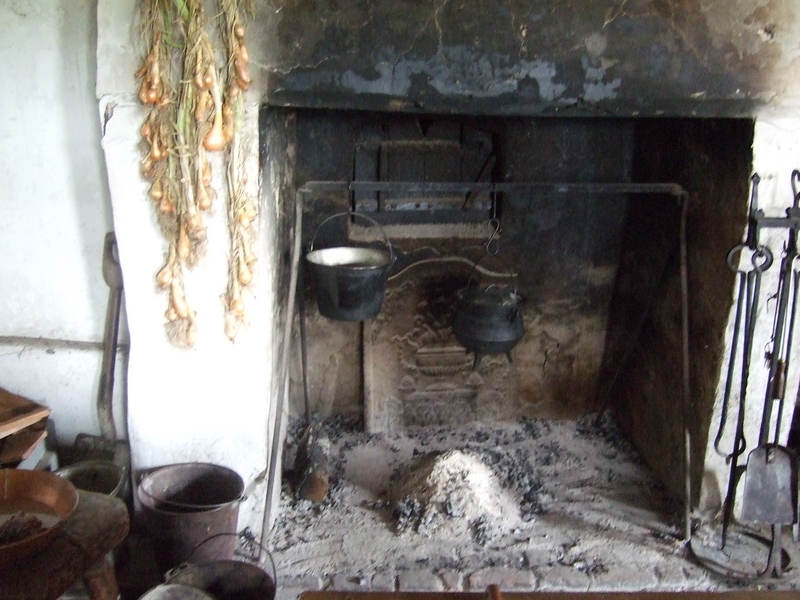 When the oven was hot enough, coals were raked into the hearth and could be used for other cooking. 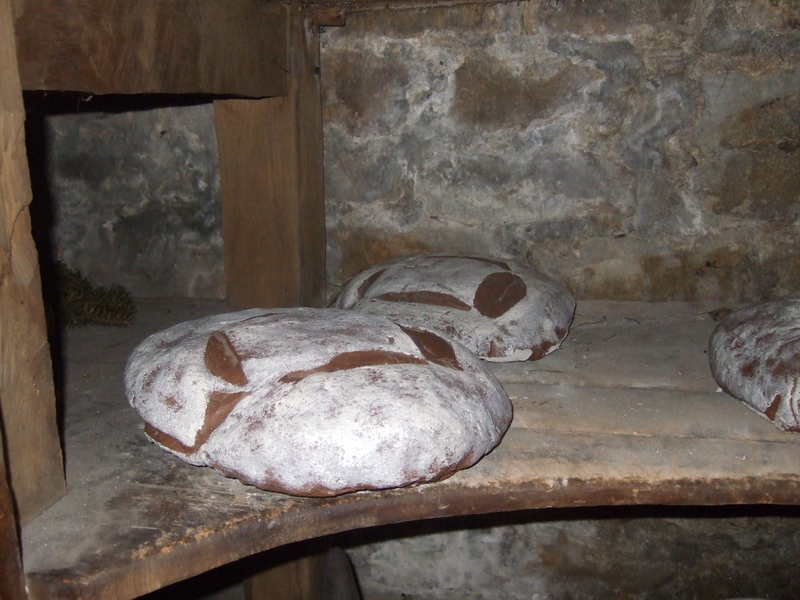 These round loaves were probably baked directly on the bricks. The interpreter at Fort George National Historic Site, in Ontario, had a slightly different arrangement (below). Her oven is off to the side, which meant she didn’t have to lean over the fire to tend the oven. The oven door is the dark shape on the right side of the photo. This was much safer, and more comfortable, than having the door behind the main cooking fire. 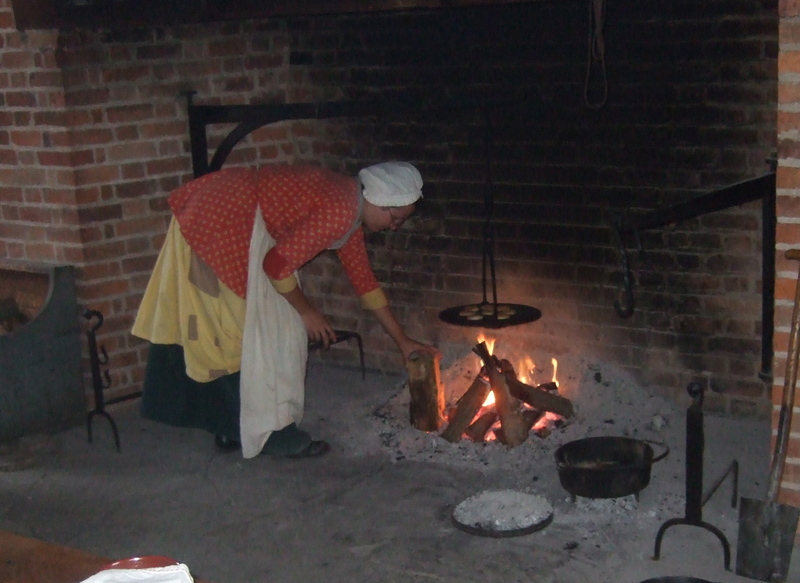 Using a bake oven was a big job, so smaller things—like these small cakes (cookies)—could be baked on a griddle hanging over the fire. 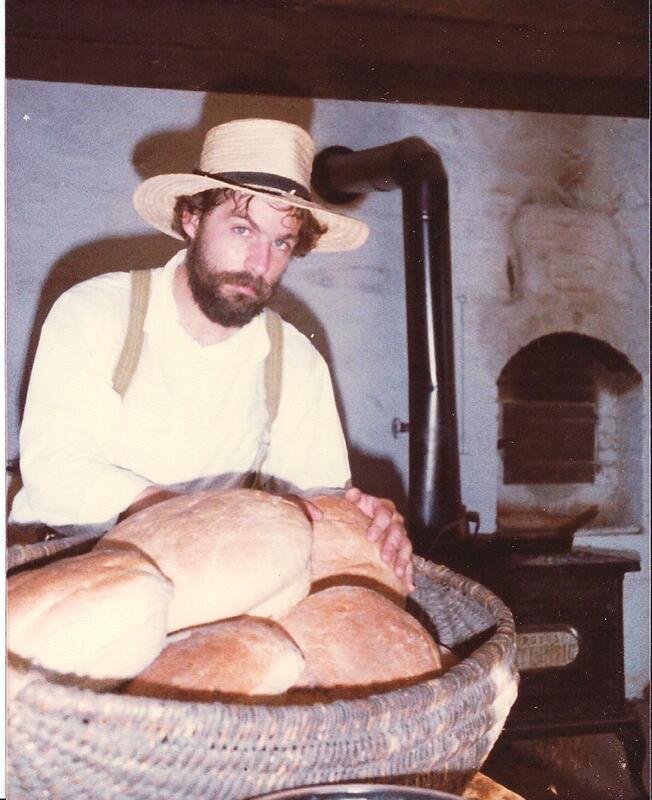 I learned to use brick bake ovens in my own interpreter days at Old World Wisconsin. In the photo below, the oven door is open. When the oven was hot enough, I’d use a hoe-type tool to rake the coals and ashes into a chamber below. (In the photo, that opening is covered with the board below the oven door.) Later I’d open the little floor-level door below the oven and shovel the cold ashes out. That’s me, explaining the process to visitors. I used the long-handled paddle leaning against the wall to the left of the oven to place the bread dough into the oven, and remove the finished loaves. The length of the pole gives you an idea of how big the oven is! Experienced bakers knew how to get the most out of a hot oven. When the bread came out, smaller items such as coffeecakes went in. When they were done, there just might be enough heat left to bake a pan or two of cookies. This kitchen is at a farm restored to 1875, which has a modern cookstove. So why would someone still use a bake oven? Perhaps she needed a dozen loaves to feed a hungry farm crew, as we did the day this picture was taken. All from a single baking. It took some practice to get the hang of using a brick bake oven. But one taste of hot, crusty bread spread with homemade butter made it all worthwhile.